A slightly apprehensive-appearing Prince George arrived for his first day of formal education Thursday, wearing his school uniform and holding on to his father’s hand. Missing was the 4-year-old’s mother, Kate, the Duchess of Cambridge, whose third pregnancy was announced earlier this week and is suffering from severe morning sickness. Instead, Prince William escorted their son solo onto the grounds of the private Thomas’s Battersea School, located in an upper middle-class London neighborhood just a few miles from Kensington Palace. George, the third in line to the British throne, arrived wearing his “summer uniform,” which consisted of a blue button-down shirt beneath a navy v-neck sweater and matching shorts. 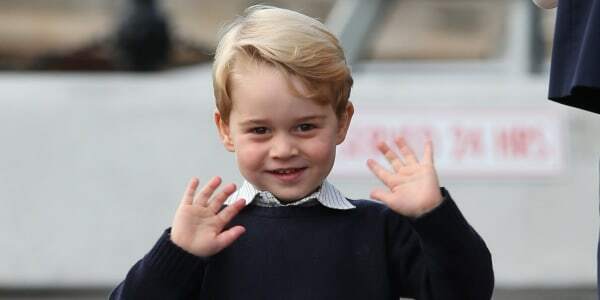 The young royal will be known at school as George Cambridge. The first day of school was the latest event in a momentous week for the royal family. Kensington Palace announced on Monday that Duchess Kate was pregnant with her third child, but also suffering from hyperemesis gravidarum, an acute form of morning sickness she experienced during her previous pregnancies. As a result, Kate pulled out of two public engagements earlier in the week and left royal watchers speculating whether she would be feeling well enough to take her son to school. “Unfortunately, the Duchess of Cambridge remains unwell, and will not be able to accompany Prince George on his first day of school,” the palace said in a statement earlier Thursday. Instead, Prince William dropped off their son as planned, driving him to school in the family’s Range Rover. The two were greeted on the grounds by the head of the Thomas's lower school. Kensington Palace marked the occasion by posting a tweet of throwback photos featuring George's father and uncle, Prince Harry, heading to their first day of school with their mother, the late Princess Diana. George had previously attended a Montessori nursery school, starting back in in January 2016, that was located near his family’s country home in Norfolk, where his father previously worked as a helicopter pilot for an air ambulance company. The family has since moved back to London's Kensington Palace as Prince William began to take on more royal duties. "It was really nice actually. It's a nice school,” he said while attending a reception for a British soccer association. Tuition to co-ed institution is about $8,350 (6,385 British pounds) per term, according to a 2017 London-area school guide. According to the school’s website, it offers a “rich and broad curriculum” that includes art, ballet, drama, French, music and physical education. About 540 students from ages 4-13 are enrolled at the school.